September -Time to sign up for classes! We all love the reds, oranges, yellows ,purples and greens of the fall colours and you can bring them into your home with a lovely stained glass panel! 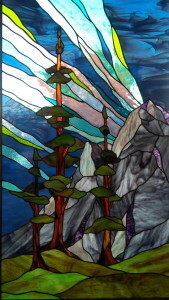 Of course we are happy to make you a custom window or stained glass hanging of leaves but you can also learn to make your own stained glass or fused glass panels here in our classes. A September sight – getting ready for flight. 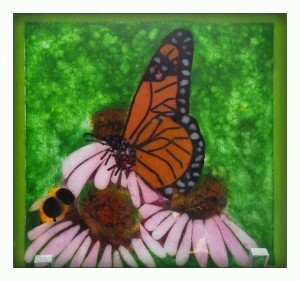 This fused glass picture was made with glass frit, powders and cut glass and fired on a clear glass base. It measures 8″x8″. 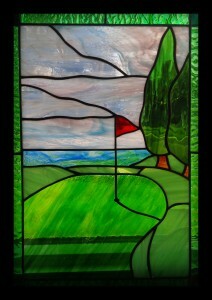 This Golf Panel just invites you in to enjoy the beauty of the day. It measures 17.5″ x 12.5″. and is made with Spectrum and Wissmach glasses.